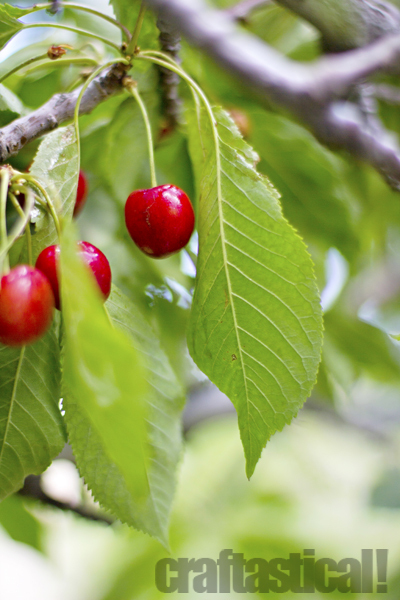 This weekend, we've been picking cherries. The cherries on our huge cherry tree out back have ripened this weekend. This is our first year of harvesting cherries. Last year, the first year in our new house, the bugs and birds got to the them. This year, we were more prepared. We are eating them fresh (I don't like them fresh, but I'm a strange anomaly when it comes to food), drying them in a food dehydrator, and making jam. So far, my sister and I have made 15 jars of jam. 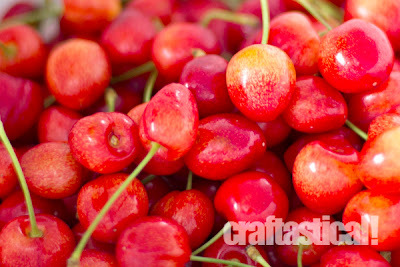 They are sweet cherries; we think they are, more specifically, corum cherries or maybe Royal Ann. I fell off a ladder while picking them. I was sitting on the top of the ladder (probably not a smart thing to do, but our ladders are short and our tree is tall, much taller than our house and I wanted those cherries!). 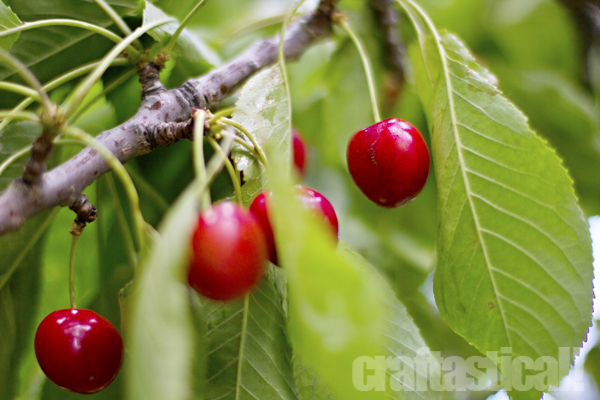 I was reaching for a cherry, and I felt like the ladder was rocking. It probably wasn't. I probably thought it was because I was reaching out too far and knew it. So, in a good example of the law of attraction, I made the ladder rock back and forth more because I thought I felt it rock and was trying to compensate, and then, in order to not fall in a much worse manner, I jumped off the ladder, and then once on the ground, I stopped the ladder from falling on me. I might call it "falling with style" or maybe "forced jumping." Really, not just anyone can fall off of a ladder like that. It takes a certain kind of quirkiness to have a mix of maladroitness, accident-prone stupidity to make yourself fall off a ladder and yet still possess the agility to sidestep serious harm. I mean, who causes themselves to fall off a ladder and then saves themselves with a graceful, gazelle-like jump and doesn't even knock over the ladder? 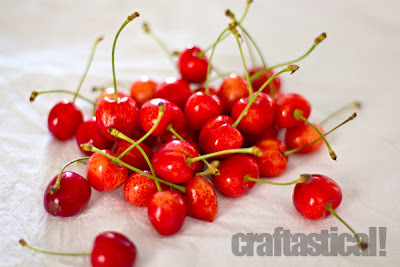 I only lost a few cherries from the bucket I was holding. Also, I got stung by a wasp yesterday. I went a whole 29 years never being stung by a wasp or a bee and I've been stung twice this summer. Once at Disneyland! I got my first bee sting at Disneyland! The universe is mean. I also don't do anything to deserve it. I'm just minding my own business and suddenly I feel a little stinging barb and I'm looking around, going, "Crap! What just happened!" Some bee/wasp just felt like coming along and getting me. My sister told me today it's because they know how mean and nasty I am. My mom says it's because I'm so beautiful that they are inexplicably drawn to me. I think I'm going with my sister on this one. I'm a cranky, mean, ugly-souled lady in the body of a pleasant-looking, almost 30-year-old and apparently hymenoptera dislike me a lot. I haven't had any run in with ants lately, but I'm sure I'm on their naughty list. Suddenly, so many terms make sense. Like, I actually said, "They look like little tomatoes." And my sister gives me this look and says, "Yes, where do you think the name 'cherry tomatoes' comes from?" And I thought, "Wow, you are right! I had never fully considered the idea of the cherry tomato." If you had cherries and cherry tomatoes mixed together, you had better be careful before eating them. It could get surprising if you weren't careful. Also, cherry pickers suddenly make more sense. I would like one. Then I could avoid falling off ladders. This post was mostly to say, cherries are pretty, aren't they? I'm spending my Independence Day picking cherries and making jam. We will have a barbecue later and set off some of our own fireworks too. I will try to not fall off any ladders and avoid wasps and hopefully the two hives on my hand will go away (they popped up before the wasp/bee sting). Perhaps I should watch the fireworks from inside tonight? For I do not want to come to any more bodily harm. If you had a cherry picker, you would just be falling out of that instead. ;) Ok, probably not, since they have sides on them. 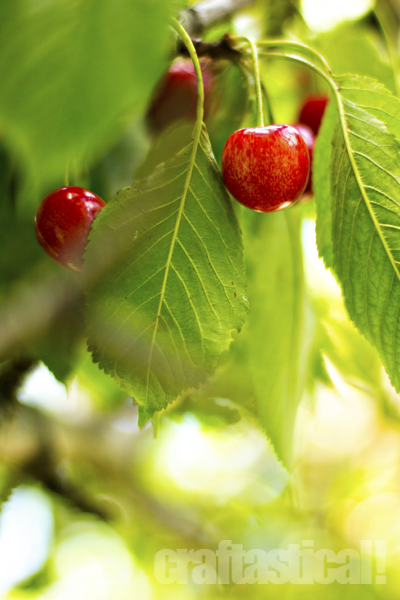 I've loved picking cherries and making jam with you! 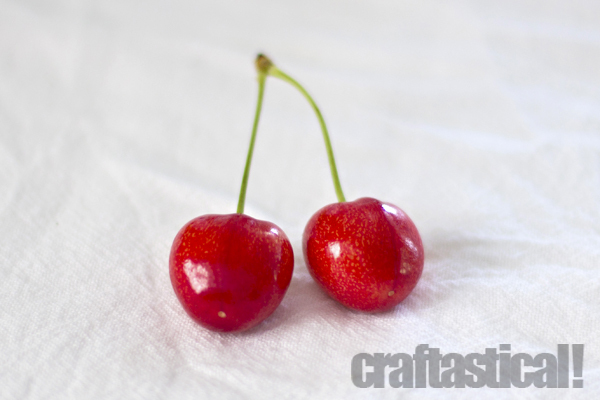 Oh - beautiful cherries - I am soooo envious! On the other hand - not so much in the winter, lol!